ConceptDraw DIAGRAM the default blank page is a one-page document. The need to create a multi-page graphics document is a fairly common situation. This is not about breaking a drawing or a drawing into several parts, but about the need to create multi-page graphic documentation, where each page is a separate diagram, but the entire package of graphics documentation is schematically and logically linked into the single document. You can customize the ConceptDraw DIAGRAM document for your needs by adding pages, rearranging them, or by setting a custom background. Open a ConceptDraw DIAGRAM document. From the context menu of the Pages panel, select the Duplicate Page command. A new page containing a duplicated diagram will be added to your document. Make the required changes to diagram: rearrange it, change text, or even add some new format options using Format panel. 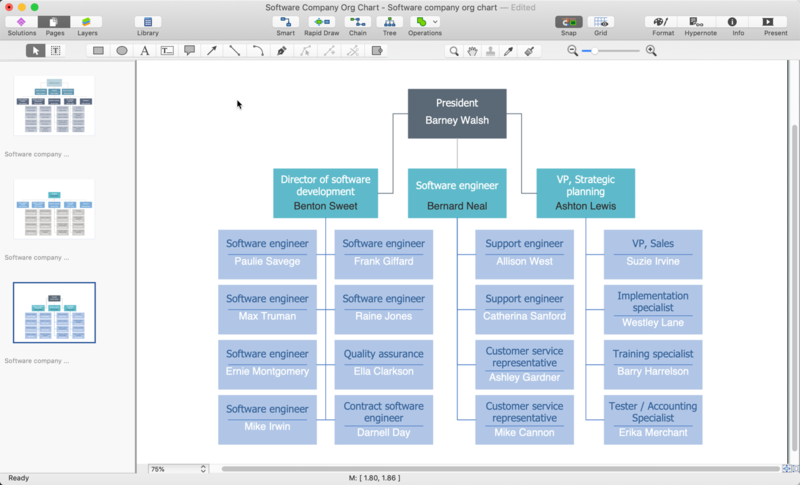 Result: We have created a ConceptDraw DIAGRAM document which contains multiple pages. On each page, we have a separate diagram (and they are thematically referred to the other diagrams of the current document).